A unique community of artists formed on the shores of Lake Tuusula in the late 1890s, as the best known representatives of the golden age of Finnish art settled in the area where the national literary giant Aleksis Kivi had spent the last few months of his life. Many of these artists then lived in Helsinki but longed for silence and peaceful surroundings. On the other hand they were unwilling to move too far from the capital city and the centre of the nation’s cultural life. 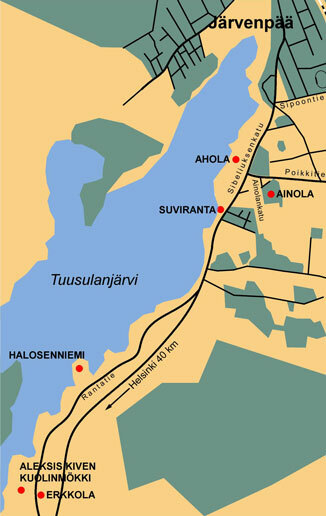 With its excellent transport connections the Tuusula district was an ideal choice under these circumstances. The first of these artists to move were the writer Juhani Aho and his artist wife Venny Soldan-Brofeldt. They rented a villa named Vårbacka from Järvenpää Manor, and began to call it Ahola i.e. ‘Aho’s place’. Juhani Aho then encouraged the painter Eero Järnefelt to become his neighbour, and Suviranta – the Järnefelt family home – was completed in 1901. The artist Pekka Halonen then built a studio villa on a rocky peninsula right next to the lake, and at the same time the poet Juhana Henrik Erkko built his house on a nearby plot of land in Syvälahti. Ainola, the home of the composer Jean Sibelius, was completed in 1904. The artistic families of the Tuusula region formed a lively social circle and their many friends spent long periods in the area. Local boarding houses accommodated literary and artistic figures such as the poets Eino Leino and Juhani Siljo and the writer Matti Kivekäs. The writer F.E. Sillanpää was also a frequent guest in Eero Järnefelt’s home. The artistic community of Lake Tuusula was a distinctive meeting place for artists, and the peaceful rural scenery of the area became the lifeblood of their creative endeavours. They encouraged each other in their artistic work and called on one another’s support to promote the Finnish national character and culture during politically restless and uncertain times.